Return home to a world of convenience, security and luxury offered in this top-floor, corner condo at the award winning Residences of King George. Built in 1912 and lovingly restored in recent years, this building is a treat to explore. It’s simply wonderful. 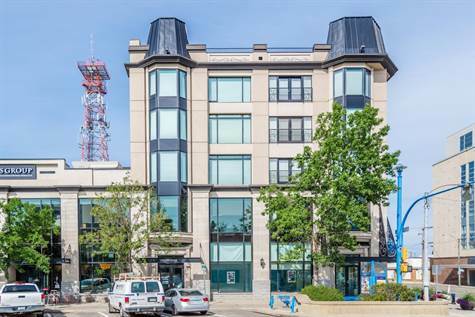 The location is hard to beat too, in the heart of Saskatoon’s downtown core. A seemingly endless number of shops, services, restaurants and night spots are available to you. Park your car underground, head out for a night on the town and make the easy walk back home later. Secure elevators keep those who don’t belong out while you enjoy the luxurious appointments found in this home. The main living area boasts ceramic tile flooring and floor to ceiling windows that provide an abundance of natural light. Custom lighting and window covering do the trick when you’re ready to escape to complete privacy. A stunning designer kitchen and the adjoining, generous dining area provides a spectacular sunset views to the west. Dark, rich cabinetry with granite countertops, and stainless steel appliances make this a special place to prepare a meal and to entertain. A huge kitchen island includes dual sinks and a ton of extra storage for all of your top-chef gadgets. Doors to the ‘Juliette balcony' in the adjacent living room allow you to enjoy an open air feel when the weather calls for it. The master bedroom is wonderfully spacious and offers a luxurious ensuite and a walk-in closet that feels more like a dressing room. You’re going to love it. Additional rooms include a second bedroom and a full guest bathroom with floor to ceiling ceramic work that looks amazing and is so easy to clean. The well equipped roof-top patio is a perfect spot to catch some sun, prepare a barbecue, or enjoy the stars over a glass of wine.